It was a curious thing about the past – how it lay in wait for you, quietly, invisibly, almost as though it weren’t there. You might be tempted to think it was gone, no longer existed. Then, like a pheasant flushed from cover, it would roar up in an explosion of sound, color, motion – shockingly alive. And we have a winner. I have the pleasure of recommending to you an author and a novel that I can heartily recommend. 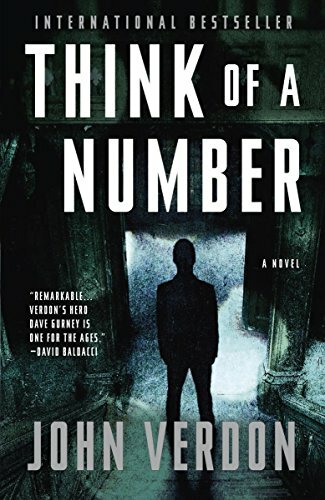 Think of a Number by John Verdon is a remarkable book, not only a superior mystery-thriller, but also a story told in a fresh and interesting way. David Gurney is a retired New York City police detective, a decorated hero. He had a reputation for finding and stopping serial killers. But he took early retirement to move to a farm in the Catskills with his wife. It’s her turn, so to speak – she put up with New York life, which she hated, for his sake. Now they’re living in the country, where there is scenery and trees and flowers and animals, a place where she thrives. But David is unhappy there. He has an intense, analytical mind, a need to solve puzzles and bring order out of chaos, that rural life doesn’t satisfy. Although they love each other, it’s not certain their marriage will survive. One day David gets a call from an old college acquaintance, Mark Mellery, who has grown rich running a religious-self-help retreat center. Mellery is desperate. He tells David that he got a letter containing a small sealed envelope. The letter, hand-written, told him to think of a number between one and 1,000, and then open the envelope. He found the random number he’d chosen written on the note inside. After that he got more letters, hand-written in verse, threatening him with death in vengeance for some unstated crime in the past. Drawn into the case in spite of his wife’s disapproval, David works along with local and state authorities to solve a stream of murders that follow. The mystery will not only tax David’s mind, but will threaten his marriage and make him ask hard questions about his own life and the lies he tells himself. Think of a Number was an unusually internal book. A large portion of the action happens right inside David’s head. It’s a tribute to author Verdon’s skill that he makes the inside of that head a fascinating place. The prose was also extremely well crafted and effective. And the story ended – in my opinion – in a very satisfying way. A couple evangelical Christians are portrayed as pretty pathetic characters in this story. And there’s rough language. But I enjoyed Think of a Number immensely, and I highly recommend it if this is your sort of thing.